We’ve seen soft organic bowling sets and even great wooden bowling sets, but never have we seen a set so purr-fectly cute before. This maple Bowling Kitty Set is made by the same folks who brought us the hyper adorable upcycled kitty egg crayons, Kitty Baby Love. This set is made with natural maple wood and the sweet kitty facial features are carved in so they won’t rub off. These come unfinished, but all edges are smoothed and rounded for safety. You can request little black faces or natural. In total you get 6 bowling kitty pins, 1 bowling ball, 1 game play sheet (which includes alternative games such as “No Tap” and “Low Ball”), 4 official Kitty Baby Love scoresheets and 1 handmade cotton canvas bag that stores the set nicely when not in use. 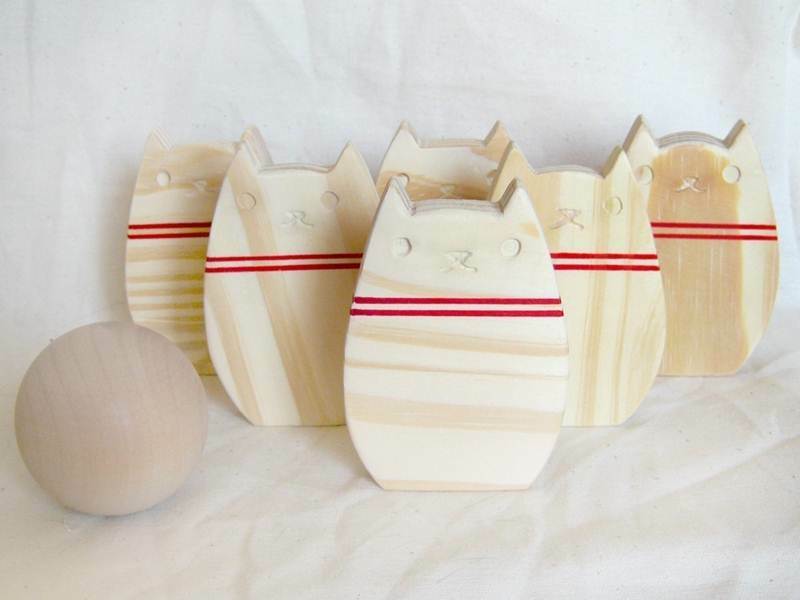 We've seen soft organic bowling sets and even great wooden bowling sets, but never have we seen a set so purr-fectly cute before. This maple Bowling Kitty Set is made by the same folks who brought us the hyper adorable upcycled kitty egg crayons, Kitty Baby Love. This set is made with natural maple wood and the sweet kitty facial features are carved in so they won't rub off. These come unfinished, but all edges are smoothed and rounded for safety. You can request little black faces or natural. In total you get 6 bowling kitty pins, 1 bowling ball, 1 game play sheet (which includes alternative games such as "No Tap" and "Low Ball"), 4 official Kitty Baby Love scoresheets and 1 handmade cotton canvas bag that stores the set nicely when not in use.